Flying staircase: Staircase without visible means of support. Colonial period: The earliest true Colonial staircases from the pre-Revolutionary period are almost exclusively functional. Often steep stairs that run to an attic, they are typically paneled or boxed-in with no balustrade and possibly a few small turnings at the top. The Colonial stairways most admired today are from the Georgian and Federal period (about 1725 to 1820) and based on classical proportions and motifs. Wren Building, College of William and Mary, Williamsburg, Va. Along with porch parts, decorative staircase parts were among the many millwork items mass-produced and sold by catalog by the 1850s. The first wave of mass-produced catalog millwork was made possible not only by advances in machine woodwork production and printing but also railroad shipping. Until the mid-century central stair halls were typical. This changed with the freedom in planning introduced with the Gothic and Italianate Revivals. 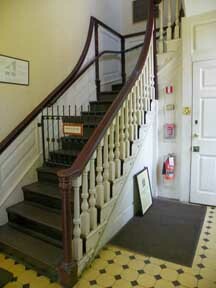 Stairs were located asymmetrically near the front door and usually near the principal parlor. Gothic and Italianate stairs tend to be a single flight from floor to floor. Newels: ranged from plain, turned posts to large square boxes built up from hardwoods. Turned octagonal common. Balusters: Often smaller versions of newels. Sometimes embellished with carvings or simply turned. Railings: Molded, often of black walnut. Designed to mate with newel tops if turned. Increasingly sophisticated power woodworking machinery made possible more elaborate carving and turnings, it also made them less expensive and more widely available. Like mantels, Victorian staircases became a place to show off manufacturing ability and money. With the adoption of combination living spaces and stair halls late in the period, stairs became the focus of further experiments, and more elaborate series of flights and landings were contrived. Windows; Often the principal landing between the entrance floor and the floor above featured a stained-glass window. The richest windows were pictorial, while the more modest ones were geometric. Stair halls were regularly lit by skylights, either with plain glazing or stair glass, sometimes with elaborate designs. Coverings:Carpet was the preferred stair covering, but floor cloths and matting were also used. Brass was a popular material for the stair rods, but iron and even, occasionally, silver are also found. Newels: Victorian staircases start proudly with an elaborate newel, which is invariably highly detailed. Covered with embellishments- sometimes from a mixed bag of stylistic idioms - the most ornate examples are wonderfully rich with worked turnings and chamfers or applied carvings and rosettes. Newels with deeply turned balls or beaded decoration may show a geometrical influence associated with Eastlake furniture styling. Somtimes gas, and later electric, newel lamps were instlled atop the post. In simpler dwellings the newel could be the most elaborate piece of woodwork in the house. Balusters: Victorian baluster designs span a wide range of turnings, square and tapered supports, and combinations of both. Sometimes the balustrade is not composed of true balusters but is instead an assemblage of horizontal and vertical members that forms a decorative grille. Railings: Handrails are also more elaborate, with decorative beads and coves along the sides below the basic face molds. Oak is highly popular, as it is for all woodwork, but yellow pine is also sold. Newels: Compared to Victorian staircases, Colonial Revival newels are relatively simple, often resembling a large baluster. Square newels were also widely sold, especially during the 19th and early 20th century, but here the Colonial influence is readily identified by Georgian / Adam ornaments, such as urn-like turnings on the tops or carved swags and cameos applied to the sides. Often painted white. Balusters: Colonial-influenced balusters are typically turned on a lathe and very thin. (Remember, turning was a favorite woodworking technique for furniture makers of the 18th century.) They use classical shapes for the patterns, and on very high-style homes, there may be more than one style of baluster in a balustrade. By the 1890s, mass production made possible a fashion for the complex turnings of twisted balusters that appeared in many architect-designed houses. Open-string stairs, where the balustrade could be featured to best advantage, often varied baluster patterns and spacing. Unlike the heyday of the Victorian era in the 1890s, when embellished wood decorated almost every surface of a house, by the turn of the 20th century the Arts & Crafts movement was introducing new design ideas and alternate materials, such as tile, metal, and exposed brick on fireplaces. Innovative staircases in landmark Arts & Crafts buildings like Red House (designed for William Morris by his friend Phillip Webb) and the Gamble House (designed by the brothers Greene) left their mark on stair millwork for decades to come. Newels: Like the furniture, most Arts & Crafts staircases are, at first glance, clean, unornamented, and deceptively simple. Ideally, there is no carving or other ornament, and what decoration does exist is meant to appear structural - for example, the workings of mortise-and-tenon joints or other connections. The square-topped newel ringed with a shallow molding like the brim of a hat is, fittingly, nearly ubiquitous in Foursquare houses. Balusters: Balusters are square-edged and unadorned. Sometimes you see tapered sides, cutouts, or fretwork in wide,flat balusters. Treads might be dominated by a single board baluster as wide as 7", or pairs that alternate between 4"-wide boards and narrow 7/8"-square sticks. 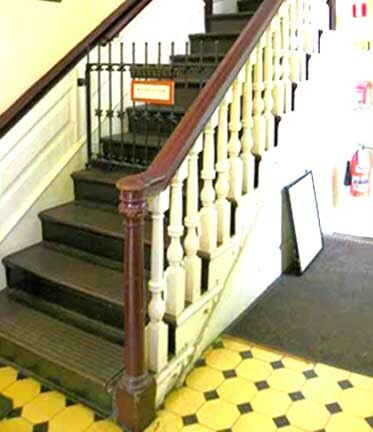 Railings: Typically bearing little or no molding, handrails are very smooth and merely rounded at the upper corners,often looking proto-Modern in the most high-style examples.